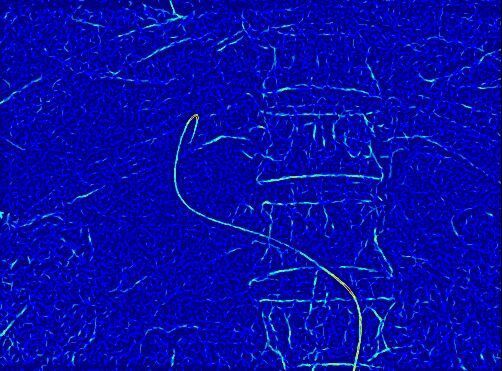 This work's focus lies in catheter and guide wire extraction from abdominal fluoroscopic sequences. Due to the fact that fluoroscopic X-ray images are of low quality and suffer from a lot of background clutter in the abdominal area the task we are working on is very difficult and not yet solved by the community. The detection process is very important since a properly detected catheter or guide wire is required by many applications that have been proposed in the last few years. One of the major goals is the enhancement of the navigation during abdominal cathterizations in order to reduce the time of interventions and thus the radiation exposure for the patient and especially the physician. Figure 1: Maximum eigenvalue image.